The Victory Stakes is a Group 2 race held at Eagle Farm Racecourse, or in recent years Doomben Racecourse, on a Saturday in late April and is one of the first features of the Brisbane Winter Racing Carnival. Run over 1200m the sprint showdown has a total of $200,000 on offer, the event was formerly known as the Sir Byrne Hart Stakes and is run under weight-for-age conditions. The Victory Stakes is an early lead-up to some of the carnival’s Group 1 majors including the Doomben 10,000 Doomben a fortnight later and the Group 1 Kingsford-Smith Cup (1350m) – formerly the BTC Cup. The latest edition of the Victory Stakes takes place on Saturday April 27, 2019. The complete Victory Stakes Results 2019 and Finishing Order will be available below once the race takes place at on Saturday April 27, 2019. Victory Stakes betting markets are usually led by proven sprinters with a good strike rate over the 1200m. Local advantage at Eagle Farm Racecourse (or Doomben) has been key in recent years as well with the likes of Buffering (2011 and 2013) and Temple Of Boom (2014) holding off horses from interstate. Runners that features in the previous year’s edition are often higher up the Victory Stakes odds for the next season if backing up and the race can feature in doubles betting with upcoming Group 1 races like the Doomben 10,000 and Kingsford-Smith Cup (formerly the BTC Cup). The season’s top Victory Stakes 2019 betting odds on the potential Group 1 winter runners will be available here on race week so stay tuned for access to the best Eagle Farm racing odds and offers. The Victory Stakes field attracts sprinters from both local and interstate stables, many of which come off runs in the Sydney Autumn Racing Carnival. In 2016 the Victory Stakes winner Fell Swoop came off a second in the Group 1 TJ Smith Stakes (1200m) at Randwick earlier in the month. Horses out of the Victory Stakes field may back up in the Group 1 Doomben 10,000 (1200m) at Doomben Racecourse two weeks later. Victory Stakes nominations close the Monday before the race runs on the Saturday and the final field along with barriers are released on the Wednesday. 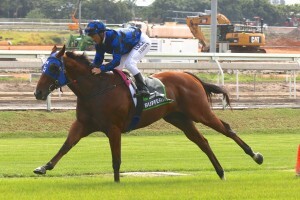 Champion sprinter Buffering won multiple editions of the Victory Stakes in 2011 and 2013. Photo Credit: Daniel Costello. The official Victory Stakes 2019 Final Field of sprinters and barrier draw will be available below once announced the Wednesday of race week so stay tuned to see what Brisbane Winter Racing Carnival hopes are in the mix for the Doomben 10,000 lead-up this season. The Victory Stakes nominations 2019 nominations close the Monday of race week with the full list of early hopefuls to be published below. Top Victory Stakes tips include looking for proven performers at the track / distance, those coming out of tougher Sydney autumn lead-ups like the TJ Smith Stakes and horses drawn well at the Eagle Farm / Doomben track. If a top class horse features in the field they are usually the ones to get behind with the likes of Swiss Ace (2008-09) and Buffering (2011 & 2013) saluting for punters in multiple editions of the race. Our Ladbrokes’ exclusive Victory Stakes 2019 betting tips and Group 2 racing selections will be detailed below leading up to the Eagle Farm showdown so bookmark this page for the winter sprinters to back and sack on way to the bigger Brisbane races of the season. The Victory Stakes form guide features all the must know info like saddlecloth numbers, barriers, jockeys, trainers and lead-up form for all horses in the field. Studying the Victory Stakes form for sprinters with good form over 1200m, Group 1 performers from the Sydney Autumn Carnival and local hopes with a nice Eagle Farm strike-rate can help with tipping. The Victory Stakes form has also stacked up in the subsequent Group 1 Brisbane Winter Carnival races in recent years like the BTC Cup that Victory Stakes winners Buffering (2011), Swiss Ace (2008) and Mitanni (2007) all went on to place in. The BTC Cup however is now run over 1300m later in the Carnival and the Doomben 10,000 is now the likely next-up target for horses out of the Victory Stakes. A link to our comprehensive Victory Stakes 2019 Form Guide will be provided for punters below the week of the race. Victory Stakes results have been dominated by nice types over the years with local runners saluting more often than not. Notable Victory Stakes winners from the past decade include Swiss Ace (2008-09), Buffering (2011 & 2013), Temple Of Boom (2014) and Srikandi (2015).